Business accounting student, Ellen Haiska brought her son, Alexander Haiska to makes some new friends. 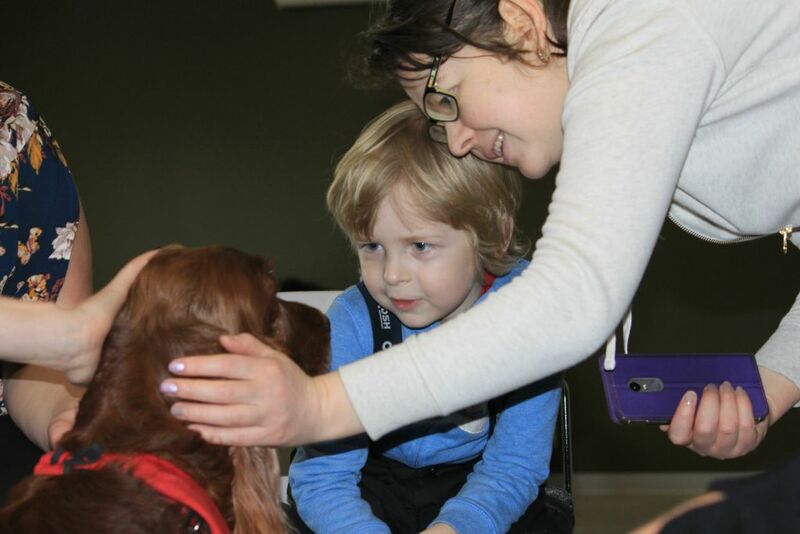 On Feb. 8 the pair visited the therapy dogs for the first time at Algonquin. St. John Ambulance volunteers greeted students again on Feb. 8, with their Paws 4 Stress dogs in the Student Commons, spreading smiles and warmth. Christine Phillips and her now 5-year-old Irish Setter, Caileigh were one of the two pairs to visit. Caileigh was ready to pose for the camera and people as soon as eager students arrived. Caileigh was originally a show dog with a good career, winning a championship in just two tries, followed by a grand championship win shortly after. Caileigh’s owner, however, feels that bringing comfort is her real calling. “I think this is what she was meant to do. She just loves her job,” Phillips said. The retired show dog now has been working with St. John Ambulance for three years and has become well-known at the college. Returning students recognize Caileigh and even call her by name. Along side them was 10-year-old Amber, an Airedale terrier with her owner David Seabright. For Seabright, he used to work as an architect at Algonquin before working with St. John Ambulance. Seabright startedto recognize students after visiting for two years. Caileigh and Amber’s journey to being adored and recognized by students wasn’t as easy as just showing up, however. There is first a process go through for the dogs to become part of the team. In cases where dogs misbehave or get a few things wrong, they are sent away to train more and can come back when they are a better fit. In situations where dogs show any aggression, they are disqualified and are an immediate closed case. The first time out, someone will accompany the duo to monitor the dog and the handler’s behaviour until they are ready to go on their own. From there, there is further testing to work with kids. Either way, the reactions can be big. “Sometimes you don’t know what the contribution has been. Somebody might receive a benefit that you’re not even aware of at the time. Other times it’s more obvious. It’s really about making a connection and animals can touch people in a way that maybe other humans can’t. The language is a language all their own,” Phillips said. With therapy dogs, they can reach people no matter the language — even people who don’t want to talk at all. A majority of the students seem to have heard of the visiting dogs from the posters put up around the college. Some students who are experiencing stressful semesters, coming into placements and mid-terms have appreciated having the dogs around. Students and the volunteers both felt the shift in stress as students talked to the handlers and among each other while laughing and extending hands to the dogs. One volunteer from the AC Hub, Shiveang Dhawa, has already been to the meets several times before deciding to volunteer. Dhawa surveys how students found out about the event at the door as students arrive to see the dogs. “I just like to come here. I’ve come here six or seven times now and this time I decided to volunteer,” Dhawa said. He too has noticed the shift in students. The dogs have had an impact on new and returning students. Dhawa noticed how the students can shift from surprise at actually seeing the dogs present to the excitement of getting to go in to see them. Dogs speak a language all their own Reviewed by Jennifer Leblanc on March 17, 2019 .